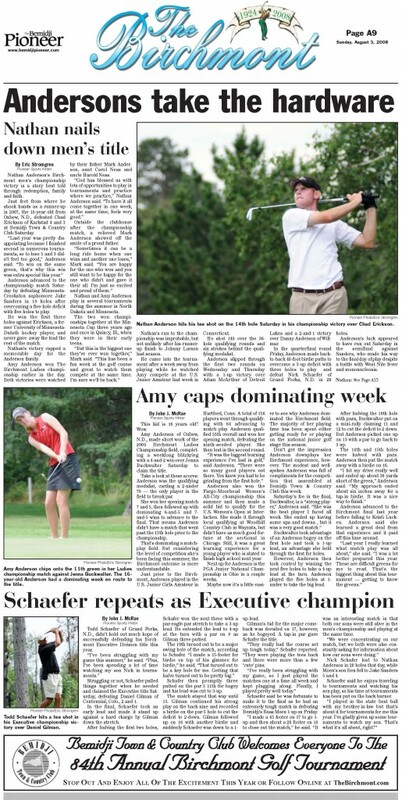 Nathan Anderson’s Birchmont men’s championship victory is a story best told through redemption, family and faith. Just feet from where he shook hands as a runner-up in 2007, the 18-year-old from Oxbow, N.D., defeated Chad Erickson of Karlstad 4 and 3 at Bemidji Town & Country Club Saturday. Anderson advanced to the championship match Saturday by defeating Minnesota-Crookston sophomore Jake Sanders in 19 holes after overcoming a five-hole deficit with five holes to play. He won the first three holes against Erickson, a former University of Minnesota-Duluth hockey player, and never gave away the lead the rest of the match. Nathan’s victory capped a memorable day for the Anderson family. Amy Anderson won The Birchmont Ladies championship earlier in the day. Both victories were watched by their father Mark Anderson, aunt Carol Ness and uncle Harold Ness. Outside the clubhouse after the championship match, a relieved Mark Anderson showed off the smile of a proud father. Nathan and Amy Anderson play in several tournaments during the summer in North Dakota and Minnesota. The two won championships together at the Minnesota Cup three years ago and once in Quincy, Ill., when they were in their early teens. Nathan’s run to the championship was improbable, but not unlikely after his runnerup finish to Johnny Larson last season. He came into the tournament after a week away from playing while he watched Amy compete at the U.S. Junior Amateur last week in Connecticut. He shot 148 over the 36-hole qualifying rounds and six strokes behind the qualifying medalist. Anderson slipped through the first two rounds on Wednesday and Thursday with a 1-up victory over Adam McArthur of Detroit Lakes and a 2-and-1 victory over Danny Anderson of Willmar. In the quarterfinal round Friday, Anderson made backto-back 40-foot birdie putts to overcome a 3-up deficit with three holes to play and defeat Nick Schaefer of Grand Forks, N.D. in 20 holes. Anderson’s luck appeared to have run out Saturday in the semifinal against Sanders, who made his way to the final day of play despite a battle with West Nile fever and mononucleosis. Sanders took a 5-up lead after nine holes by shooting 34 on the par-36 front nine. After Anderson’s bogey on the 10th hole, Sanders was 6-up. Sanders had the opportunity to close out the match on the par-3 14th hole, but a bogey and Anderson’s par left the door open. “If you are down five with five holes to go, you basically have no chance,” Anderson said. As Nathan struggled in the group ahead, Amy was closing out her match against North Dakota State University senior Jenna Buckwalter. “When I was on the 13th hole I heard he was five down, but then I heard that he won 15, 16 and 17 and I was like ‘wow, what is happening here,’” Amy Anderson said. Nathan won those three holes with three birdies. “I was just able to make putts at crucial times,” Anderson said. Amy joined the men’s semifinal group gallery on the 18th hole and watched Nathan push the match to extra holes with his fourth straight birdie. Anderson completed the comeback on the first playoff hole, the first hole at Bemidji Town & Country Club, when Sanders three-putted for bogey and Anderson converted an up-and-down par. “I tell you what, he must have had help from above because that can be the only explanation,” Mark said of Nathan’s comeback. The other semifinal match was also decided in 19 holes when Duane Wages Jr, of Moscow, Idaho, three-putted for bogey and Erickson made par. After the 5-hour semifinal match, Anderson spent his 20-minute break on the driving range fine-tuning his swing. “I got my swing back to where I needed it to be and I had a lot of confidence going into the second match,” Anderson said. Anderson adjusted club position on his backswing on the range. The championship match started strong in Anderson’s favor with two steady pars on the first two holes as Erickson bogeyed and doublebogeyed. Anderson won his seventh straight match-play hole on the par-4 third hole with a birdie, extending his championship match lead to 3-up. Anderson took a 3-up lead on the par-4 eighth hole after he put a 60-yard wedge shot to eight feet and drained the birdie putt. He nearly gave it away on the par-5 ninth hole after spraying his tee shot to the right over trees and into the 10th fairway. He was forced to play his next shot down the 10th fairway and proceeded to make a sand save to halve the hole when Erickson missed his birdie putt. Anderson’s only mistake the rest of the way was a threeputt bogey on the par-4 12th. He then birdied the 13th, 14th and 15th holes to claim The Birchmont men’s championship. After shaking hands with Erickson to end the match, Anderson greeted his father with another handshake as Amy, Carol and Harold watched. Nathan did not play with a caddy all week, so Mark was happy to take Nathan’s clubs on the walk back to the clubhouse. Anderson’s mother, Twyla, was unable to attend this week’s events. She was in Rochester with her mother Leilla Moll, who is recovering from cancer surgery. When Twyla returns, Mark said that the family will celebrate by going out to have a nice dinner to talk about the victories. Nathan said he would like to have a career playing golf, but is realistic about his dreams. Amy and Nathan are home schooled and while golf may seem to define the Andersons, they shared their strength in their faith. Up next for the Andersons another family outing in Maineville, Ohio where Amy will compete in the Professional Golf Association Junior Championships. More golf for the Andersons, though Mark was happy to point out something else about his children.